I am trying some more work with Jumpcut for editing movies (see ABC Movie Project for more information) and I just figured out how to embed JC here into Edublogs (I think), so I went into Jumpcut this morning and took apart, and then glued back together again, segments of some of my own letter movies. Talk about nervous. My 9-year-old son flew by himself yesterday to San Diego, and then is off to Hawaii today, on an epic journey (for him) to meet up with his uncle, who is a commander of a Navy Destroyer. The ship — the USS Milius — has been in the Persian Gulf as part of the war for the past six months or so, and they are now on their way home to San Diego. As part of the return trip, they can invite one family member (not a spouse) to join them from Hawaii to San Diego, and my oldest son said “yes” (surprising us) when his uncle asked him to come along. Needless to say, we were worried about him flying alone (things went fine) but also excited for this once-in-a-lifetime adventure. I sent him with a camera and my little flash video camera, and he has to write in a journal every day (that’s what he gets for having a mom and dad who are both teachers and writers) and give a report when he gets back to him in 10 days. This the longest we will have been apart, ever, so I am already missing him! And most of all, we are happy that his uncle is coming home safe from the war. 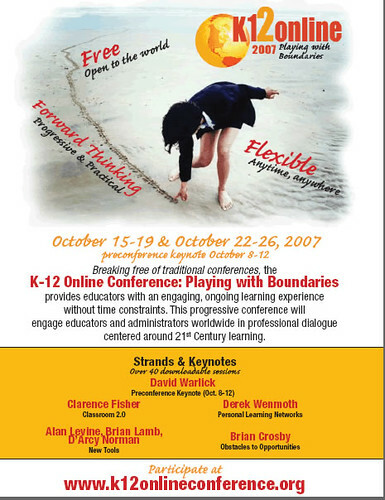 My friend, Bonnie, and I are presenting at this year’s K12 Online Conference and we hope to show folks how we used the tools of Web 2.0 to create a learning environment for other educators as part of our Collaborative ABC Movie Project. We’re a bit mystified about how the conference will go but we are confident we can handle it, and already have some great ideas brewing for folks who “attend” our virtual workshop. This wonderful video — appropriately titled “Inclusion” — was shared through a listserve that I am on through the National Writing Project and it features a fourth grade classroom that uses Skype to videoconference with a fellow student who is homebound due to Leukemia. The video is narrated by students and it is powerful in the ways that we can use technology to reach out and connect with others. I use Google Docs all the time for collaboration for workshops and meetings, and for my own writing — I can move from one location to another without having to hang a flashdrive around my neck. In fact, yesterday, in class, as my students were doing some freewriting, I was writing a poem that I put on my Google Docs and then revised it back home. Now, Google has added a presentation (powerpoint) format to its Google Docs platform and it seems to be pretty cool. A bunch of folks are already trying it out and seeing what is possible and what is not (you can upload PP shows but not Keynote, apparently), but the idea of collaborating on a presentation seems pretty nifty to me. Cool Cat Teacher created this slideshow collaboratively to show some of the ins and outs of the tool. Meanwhile, I found this video from CommonCraft (those guys again!) on how to use Google Docs. It’s a bit old but still useful. I came upon an interesting article in Wired Magazine about something called Creative Crowdwriting and it involves writing a novel by opening up the publication to the entire world to add to, edit and alter. The platform is often a wiki and the response to such endeavors is mixed — some see it as nothing more than unstructured mayhem while others tout it as an ideal product of collaboration. This concept is similar to the one I have used with wikis and collaborative storywriting, in which I invite a set audience (usually my students but sometimes my teaching/professional colleagues) to add to a developing story via a wiki. The results have always been interesting but the product is less the goal than the collaboration, I think. I am not sure more brains have made the stories any better. But here is an application of this concept that I would like to try with students with wikis and collaboration — creating Make Your Own Ending Stories via a wiki site and I might try that this year. I’ve been busy getting myself and my students situated in Week Two but that hasn’t stopped us from creating a podcast for our class Weblog site. The podcast emerged from a writing prompt on Sept. 11, in which we talked about the impact of change on the world from a negative standpoint and a positive standpoint. We brainstormed ways in which the world needs some help and then they wrote briefly about how they would change the world, if they could. I have been in the midst of a year-long project to write and publish and podcast at least one poem per month, and part of that effort is to collect enough poems to self-publish some kind of book later this year. 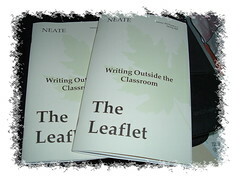 Until that moment, however, I submitted a few of the poems to the New England Association of Teachers of English journal — The Leaflet — and two of the poems were just published.